After twelve nominations in the past 26 years, the thrash veterans finally earned a victory in the Metal category over tunes by Baroness ("Shock Me"), Gojira ("Silvera"), Korn ("Rotting In Vain") and Periphery ("The Price Is Wrong"). Megadeth received the honor as part of the pre-broadcast awards, which saw comedian Margaret Cho announce the group while the house band inexplicably performed “Master Of Puppets” by Mustaine’s former group Metallica. "I want to thank Jesus Christ, I want to thank my wife, my children, all the band's wives and kids,” the rocker continued. “I want to thank our management, our label, our agent, our attorney, our crew, all of you, especially the metal community. It's a little weird that we ended up being category 69, but somebody's got a sense of humor." “Dystopia” debuted at No.3 on the US Billboard 200 upon its release, marking Megadeth’s highest-charting US album since 1992’s “Countdown To Extinction”, which launched and peaked at No. 2. Ahead of their spring and summer concert dates, Mustaine is hosting a Megadeth Boot Camp weekend that will see fans join the group on his private estate in Fallbrook, CA from March 10 - 13. 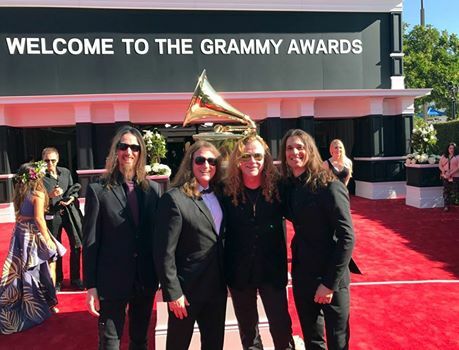 The event will feature an acoustic performance by the band along with fireside stories from the road; guitar, bass and drum lessons, and a jam session; an off-site wine tasting with Mustaine, and more.